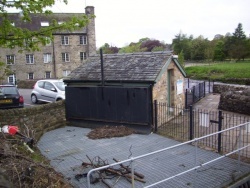 The Power House provides a secure, weatherproof building for the Gearbox, Generator, Control Panels, Data Recorder and Hydraulics that control the automatic sluice gate. 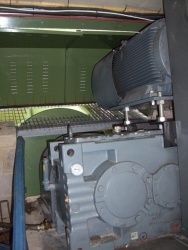 The Automatic Sluice Gate is attached to the rear external wall of the Power House. Water is drawn from the river, down the Head Race, through the Automatic Sluice Gate, under the Power House, down the Archimedes Screw and back into the river. 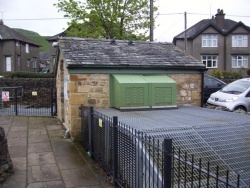 Guard covering the Automatic Sluice Gate. 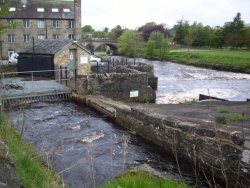 When the river level rises above the specified level, the Sluice Gate is automatically opened allowing water to flow down to Archimedes Screw to start it turning. Electricity is now being generated! 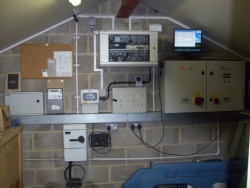 A sophisticated control panel automatically controls the rotational speed of the screw in order to maximise the amount of electricity generated at the prevailing river level. When the river level falls below the specified level, the Sluice Gate is automatically closed and electricity generation is halted. Website Designed and Maintained by Steve Amphlett © 2019 Settle Hydro Ltd.